Anakin Says, It's Patreon Giveaway Time! My Patreon page will be a place for me to interact and connect with those who want to know more about me and my art. I will be sharing with you a more personal look at myself, my creative processes and inspirations than I currently do on any other social site. Depending on what Patreon Reward Tier you pledge to you will have the opportunity to see exclusive peeks of what goes on behind the scenes in my career (Patreon Only Posts, Works In Progress & New Art will be posted here first, & lots more. ), receive unique perks in the form of discounts to my website (Your Own 20% Off Code to Tigerpixie .com & Special First Dibs List for New Art! 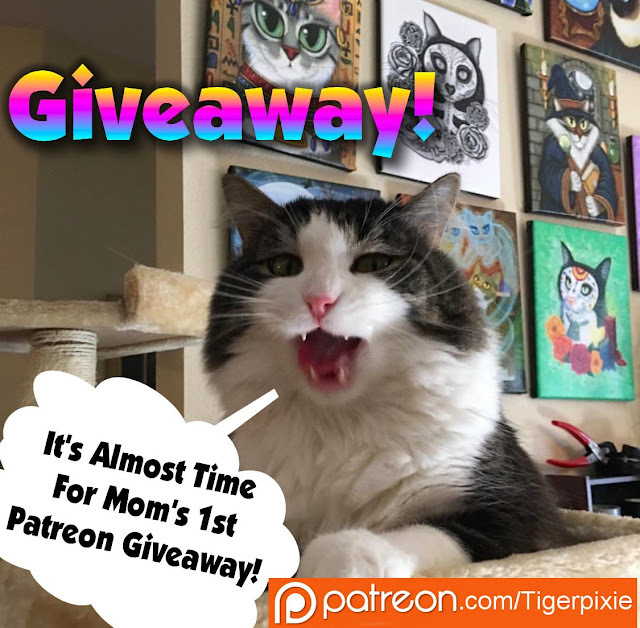 ), special items just for you, (Monthly Original Artwork, Sketches, Prints & Gift Sets mailed right to your door) and be entered in giveaways only available for my Patreon subscribers (Giveaways will be at least once a month sometime more). Some Reward Tiers, like the ones with Monthly Original Art do have a cap on the number of patrons that can pledge to them so don't miss out on them. Your Patreon pledges will be going specifically to supporting my artwork such as my business related costs, supplies and equipment I need to keep my art career thriving. You are able to edit your subscription or cancel at any time. I really think this will be a fun way to get to know each other better & will be much more personal than other social media sites. To me Patreon feels a bit like the early days of blogging and I really like that a lot. Please let me know if you have any questions about any of this. Every little bit of support helps me be able to continue making my art and your support means so much to me. Thank you so much for looking and hope to see you there! Arya is continuing to get better. It's been 2 steps forward one step back along the way. While I was out of town they did an X-ray to check her insides since she's been bloated and had diarrhea. Everything looked normal. She has put on some weight and is now up to 2.75 pounds from 1.75. She is much more alert, grooming herself and wants to play with cat toys too. Arya has a UTI and is on antibiotics for that. She is also on a probiotic and baby gas drops. She's been running a fever of 104.2 at its highest. They gave her SubQ fluids & I have more for this weekend. My vet thinks the fever could be the beginning of an upper respiratory infections since she still has a little bit of gunk in the corners of her eyes. The anabiotic she is already on for the uti will cover any kind of secondary infection from a respiratory infection. She still has worms & got another dewormer today. She had bloodwork done and is FIV and leukemia negative. Her Bloodwork all looks good except for mild anemia but that could be from the worms she has. The test for FIP/Coronavirus and toxoplasmosis will be back next week. She acts like she feels pretty good, purring, curious, eating & drinking fine and wants to play a little. I think that just about covers everything. Thank you so much for all your well wishes and support. I will keep you all posted! Anakin snoozing the day away! 😺❤️ I'll have an Arya update posted in a little bit! Also for those that have asked, thank you for worrying about us. As of right now we are not in the path of hurricane Irma. We live on the Florida/Alabama border in the panhandle of Florida.